Axel’s Tru Calling Windancer or “Tru” as we like to call her is a truly phenomenal dog. Her bloodlines which are listed below has many a champion in them for field, show, obedience, and even a little agility thrown in. What exactly does this mean you may wonder, well it means she is beautiful to watch in whatever endeavor she undertakes. In the field, she adjusts to you. If you’re on horseback she ranges far. On foot she hunts close. In the house she is most commonly found lounging in her big plush chair. Her favorite thing to do outside the field work is to go rollerblading. Her disposition is calm and refined. As a puppy, she spent her days curled up under my desk at my office in downtown DC. In 2005 she was ranked #1 in Derby by the WCA. She also won the Eastern Conference Derby stake, and took 4th is the Eastern Field Futurity. One of the silliest things about her is her obsession with the snow...SHE Loves it, loves to be in it and play with it which is very amusing because weim's as a breed have pretty thin skin and short hair. 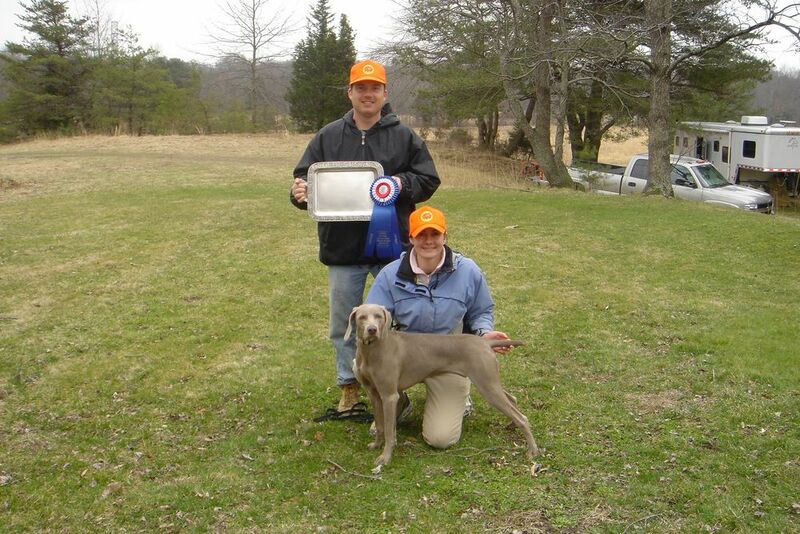 We bred Tru in 2009 to an amazing field dog Blitz. Our beloved Echo was 1 of 6 puppies from that love match. You can see Echo on her Page and the other 5 are listed on the Honorary Quaker Pointe page. Tru's 1st Field trial and she took 1st place in both Puppy and Derby states! At home Tru is our little Princess. At work in the field, Tru is relentless in finding whatever she has been given to search for.